Batu Pahat bus terminal is located at the old town area of Batu Pahat. The bus station was without the shelter many years ago. 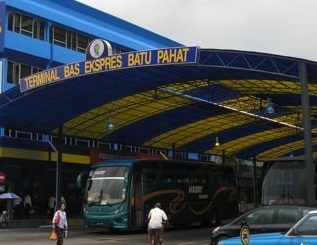 Shelter was then built in recent years for better arriving and boarding service in Batu Pahat bus terminal. Batu Pahat bus station is relatively small as compared to Johor Bahru Larkin bus station because of limited route services. Three of the major bus routes in this station are Batu Pahat to KL, Batu Pahat to Johor Bahru and Batu Pahat to KLIA/KLIA2.